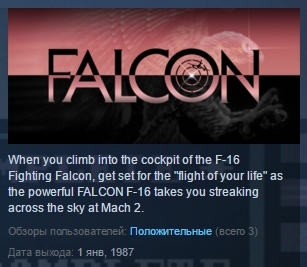 When you climb into the cockpit of the F-16 Fighting Falcon, get set for the "flight of your life" as the powerful FALCON F-16 takes you streaking across the sky at Mach 2. Accurate weapons system, head-up-displays, cockpit controls, and overall flight characteristics make this the ultimate in simulations. The enemy MiGs you encounter are resourceful and very skilled. Whether you are a novice pilot or a real "top gun," FALCON is for you! 3-D graphic images of buildings, forests, freeways, and bridges flash by as you fly at the speed of sound only 150 feet above the deck. Take out bridges, power stations, tanks, airfields, and SAM sites. Even fly with an F-16 wingman as you take on one of the many daring missions. "Sweaty palms" and a pounding heart are normal occurrences during dogfight engagements in FALCON. Mastering the most effective use of your heat-seeking missiles, Maverick missiles, bombs and cannon systems will determine your destiny. The MiG-21´s will be merciless. FALCON - you won´t believe it!